The band you choose will make or break your event. This Orlando Caribbean Band is the very best! They are one of the most frequently hired Caribbean Bands in the country. They have also been voted "Best Reggae Act" by the Orlando Weekly Magazine. 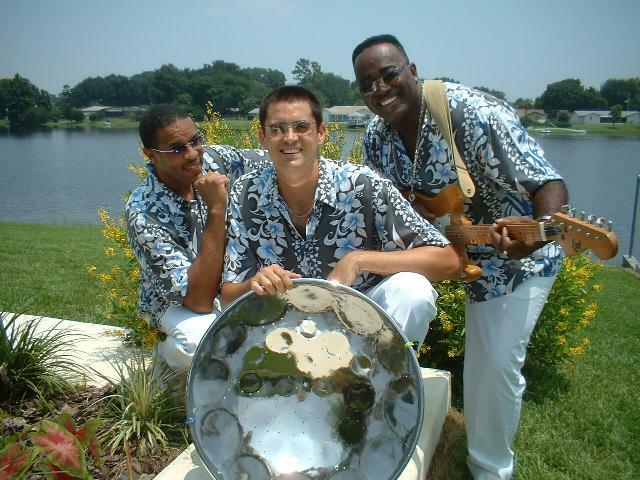 Based in Orlando, this band is one of the most popular choices when it comes to live music and they are proud to have some of the top steel drum players, musicians and entertainers in the state. They provide wedding entertainment in the form of Steel Drum Music, Caribbean Music, Island Music, Calypso Music, Reggae Music and Soca Music for weddings, beach weddings, island weddings, destination weddings, wedding ceremonies, the cocktail hour, the wedding reception and rehearsal dinners. The lead singer can even serve as MC and take care of the formal introductions and announcements. During the wedding ceremony, the steel drum player can perform traditional wedding music on the steel drums, such as the Bridal Chorus, Canon in D and the Wedding March. If you prefer something non-traditional, the steel pan player can perform a nice reggae selection for the processional and an upbeat calypso selection for the recessional. This Orlando Caribbean Band also provides Caribbean Music and Island Music for corporate events, conventions, holiday parties, Christmas parties, house parties, pool parties, birthday parties, anniversaries, retirement parties, graduation parties, fundraisers, christenings, or any other special occasion. They are well known for their high-energy and interactive performances. The musicians are all from the islands, giving you an authentic, Caribbean sound. While on stage, they teach different dances to the crowd, as well as many other 'follow-me' routines. This Orlando Caribbean Band is very professional, both in their attire, and approach to every event. They always arrive early and starts on time! This Orlando Caribbean Band offers a wide variety of original and cover music, from traditional reggae and calypso, to modern day soca and dancehall. They also perform some Top 40 hits, folk songs, Jimmy Buffet selections, traditional wedding ceremony music and other popular wedding music and wedding songs. During the holidays, they can perform traditional Christmas Carols and other Christmas Music and Holiday Music on the steel drums. They can be as small as a solo steel drum player, or as large as a five-piece live band. It all depends on the size of the event and the available budget. 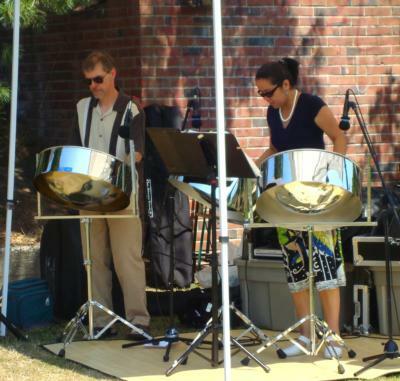 All acts include a steel pan player, which is something that your guests will really like. Past appearances as well as upcoming appearances are too numerous to list as this Orlando Caribbean Band does over 200 shows per year. They have had hundreds of satisfied brides hire them for their weddings. Some of the satisfied corporate clients include: Ashton Woods Homes, Bank of America, British Airways, Budweiser, Carnival Cruise Lines, CNL, Coca Cola International, Cutter & Buck, Fantastic Sams Franchise Corporation, Florida Hospital, GE Healthcare, Habitat For Humanity, HBO, Honeywell, KFC, Marriott Vacation Club, The Melting Pot Restaurants, Nordstrom, Novartis, Orlando International Airport, Orlando Magic, Robb & Stucky, Siemens, Suntrust and Toll Brothers. This Orlando Caribbean Band has performed at hundreds of different venues for weddings and corporate functions. Some of the venues that they perform at quite regularly include: Caribe Royale, Don CeSar Beach Resort, The Florida Hotel, Gaylord Palms Orlando, Ginn Hammock Beach Resort, Hilton Clearwater Beach Resort, Hilton Cocoa Beach, Hilton Oceanfront Resort Daytona Beach, Hilton Singer Island, Hyatt Regency Grand Cypress, JW Marriott Orlando-Grande Lakes, La Playa Beach and Golf Resort, Marco Island Marriott Beach Resort, Marriott World Center Orlando, Naples Grande Beach Resort, The Breakers Palm Beach, The National Hotel South Beach, Ocean Key Resort and Spa, Omni Champions Gate, Orange County Convention Center, Paradise Cove, Renaissance Orlando Resort at Sea World, Ritz-Carlton Orlando, Ritz-Carlton Sarasota, Rosen Plaza Hotel, Rosen Shingle Creek, Royal Pacific Resort at Universal Studios, Saddlebrook Resort, Sanibel Harbour Resort and Spa, Sheraton Sand Key Resort, The Shores Resort and Spa, Tradewinds Resort, Vero Beach Hotel and Club, The Walt Disney World Swan and Dolphin Resort and Wyndham Orlando Resort. They have also performed at several Colleges and Universities. These include: Bethune-Cookman University, Embry Riddle Aeronautical University, Georgia State University, Orlando Culinary Academy, Ringling College of Art and Design, Rollins College, Savannah College of Arts and Design, Semester at Sea, South Dakota State University, Stetson University, The University of Central Florida, University of Florida, University of South Florida, University of Tampa, Valdosta State University, Tallahassee Community College, Palm Beach State College and Webber International University. This Orlando Caribbean Band has been hired by the following cities to perform every year at community festivals throughout the state of Florida: City of Orlando, City of Tampa, City of St. Petersburg, City of Jacksonville, City of Miami, City of Tallahassee, City of Cocoa, City of Kissimmee, City of Deltona. They have performed alongside reggae superstars Shaggy, Inner Circle, Ziggy Marley and Sean Paul. Performances have taken them as far as Denver, South Dakota, New York, North Carolina, South Carolina, Atlanta and throughout Florida and the Caribbean. No matter what the occasion, or where it may be, they welcome the opportunity to perform at your event! This Orlando Caribbean Band travels and is willing to perform anywhere in the world! Some of the cities in Florida (FL), Georgia (GA) and South Carolina (SC) that the band services on a regular basis include: Orlando, Lakeland, Tampa, Palm Harbor, Dunedin, Treasure Island, St. Pete, Clearwater, Anna Maria Island, Sarasota, Sand Key, Siesta Key, Longboat Key, Ft Myers, Bonita Springs, Captiva Island, Naples, Marco Island, Florida Keys, Key West, Key Largo, Islamorada, Key Biscayne, Miami Beach, South Beach, Fort Lauderdale, Singer Island, West Palm Beach, Palm Beach, Jupiter, Port St. Lucie, Fort Pierce, Vero Beach, Melbourne Beach, Cocoa Beach, New Smyrna Beach, Daytona Beach, Ormond Beach, Palm Coast, St. Augustine, Ponte Vedra Beach, Fernandina Beach, Jacksonville, Jacksonville Beach, Amelia Island, St. George Island, Gainesville, St. Simons Island, Jekyll Island, Savannah, Atlanta and Hilton Head. This Orlando Caribbean Band has full liability insurance.